It was never a secret that the prominent members of Bush family are not the strongest Donald Trump supporters, but in a new book about former First Lady Barbara Bush, readers will get a glimpse of just how much she couldn’t stomach the guy. 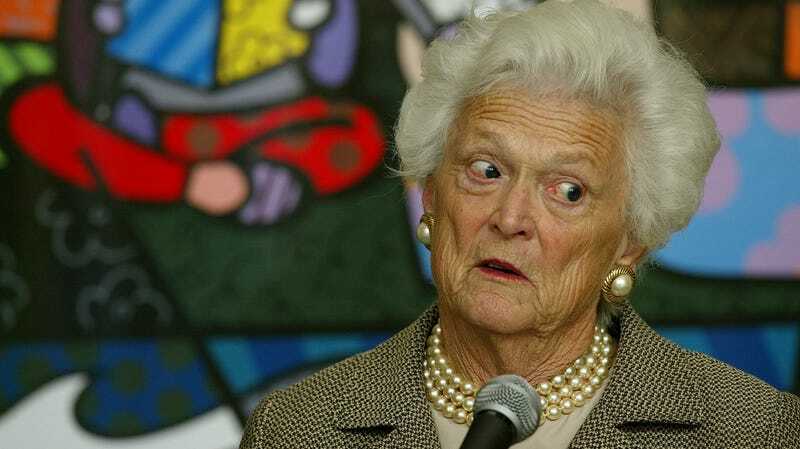 In an excerpt published on USA Today from the forthcoming book The Matriarch: Barbara Bush and the Making of an American Dynasty, author Susan Page shared that Barbara Bush directly blamed Trump for her heart attack during the 2016 primaries. “The tumultuous presidential campaign in general and Trump’s ridicule of son Jeb Bush, in particular, had riled her,” Page explains. Barbara confirmed to the reporter that “angst” was the culprit. While there are a number of additional details that illustrate Barbara Bush’s overall displeasure with Trump and the evolving nature of the Republican Party, there is no detail thus far that is quite as arresting as the fact that the former First Lady kept a digital clock, a gift from a friend, that “displayed how many days, hours, minutes and seconds remained in Trump’s term.” Per the excerpt, the clock remained proudly at her bedside until the day that she died.